You Lucky Barstard is steadily growing more and more popular in the slot machine games arena. This slot machine game is a 3 reel 1 payline game which allows you to play up to 6 coins per spin. Coin denominations range from $0.10 to $10. As the Lucky Barstard name suggests, the main symbols used in the game are the BAR symbols. Check the paytable before you play to find out the winning combinations you need to land. 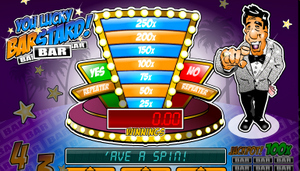 Players will enjoy the bright colours used in the game and the chance to win the jackpot of 1000. Lucky Barstard has both bonus and gamble features but no multiplier. It is also available in Instant Play for easy access without the need to download.